Backed by a 1 year manufacturing defect warranty. If during the 1st year the band fails because of manufacturing defects we will replace the band for you. This warranty does not cover cutting, pinching or squashing the band. Oils will eventually harm the band. I Originally got to this website from a recommendation from somebody at my gym and it was one of the best recommendations for awesome lift gear! I've wanted to try reverse bench press for the longest time and just never got around to doing it. every sporting goods store I went too had bands but they would be so expensive! Like 40 bucks for 1 band and it wasn't even good quality so 1 pair of bands would be like 80$! But I got an awesome deal on this website for less than half that! This is definatly a great buy if your looking for great quality bands and trying reverse bench,dynamic bench use it on Squats possibilities are endless! 5 star product! 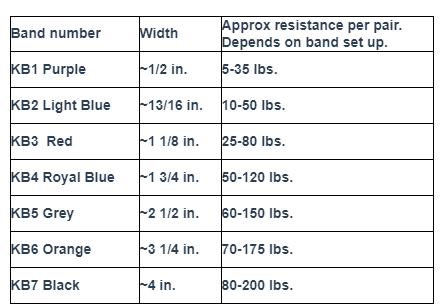 These bands are great quality and add an extra 50 lbs a side at the top of my bench and squats. I would highly recommend these to anyone considering band training. Just received the KB1 set to complete my collection. Bands have been great quality over a 2 year period, no issues. Love Lifting Large! great service and speedy delivery, keep it up! Q: Im looking for bands to help with squatting. I want to attach them to the top of the squat rack to help train with heavier weight by reducing the load as I lower to the bottom of the squat. I currently max out at around 480lb. I am unsure what strength/ color band to buy. Can you make a suggestion?